As I was writing this article (Krav Maga Military "Secrets" Part One) I was unaware that just a couple of days earlier, in my own town of Ma'aleh Adumim, a terrorist attack took place. Unfortunately the attack was not handled properly by the security forces and the attacker escaped unharmed. Yet, there is a great deal we can learn from this case. 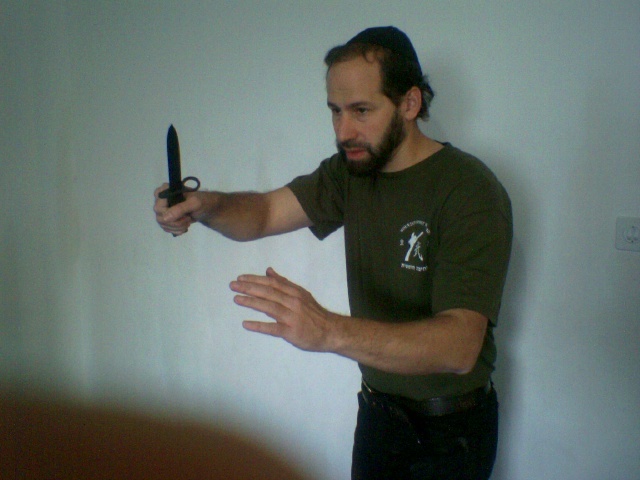 Sometimes people who are unfamiliar with Krav Maga in Israel ask me, "Where is the knife disarm?" A real knife is sharp and dangerous and can cause death quickly. Warning! Do not attempt to disarm a person with a knife, even if you are an "expert". Our approach does not focus on the knife disarm but on stopping the person who is attacking us with a knife. Danny Inosanto, the only fully recognized instructor under the legendary Bruce Lee, said these words of truth, "Knife disarms are incidental if not accidental." Incidental means that is not significant, not important, if a disarm happens in the course of your defense – fine, if not – that is also fine, the disarm is not what counts. Accidental means that sometimes in the course of your disabling the knife attacker, i.e. the person with the knife you might end up taking the knife away. This is viewed as an accident, not part of your plan, not something you set out to do. Why did you not set out to do this? Because to look for the knife disarm would be highly dangerous. This same message can be born out of the reaction to the knife attack in Ma'aleh Adumim. "Why Did You Not Shoot Him?" The headlines in our local newspaper read, "Why did you not shoot him? ", we will learn a valuable lesson from this headline. "On Shabbat during the afternoon hours a young Palestinian Arab arrived at the entrance to Ma'aleh Adumim. He hung around for a while until he found the right moment to execute his attack. As he reached the entrance (the check point) of the town, he stood facing Michael the security guard and spoke Arabic, Michael did not understand him." "Michael requested an Identification document, instead the young man pulled out a knife and tried to stab Michael in the throat. Michael pulled back and thus saved his own life. He was only superficially scratched. Next to Michael, a distance of two meters, stood Noga, the second security guard, who began chasing after the terrorist, but he did not open fire. According to Michael he also shouted (to Michael), 'don’t' shoot'".The article continues with the police investigating the question – why did the security guard not shoot? For those unfamiliar with Krav Maga training in Israel it is important for me to state what is obvious to us over here. The question that was not asked<./i> was "Why did he not attempt to disarm the knife attacker?" That question was not asked because we all know the answer – you never attempt to disarm a knife attacker, you will get badly cut or worse. The disarm is incidental or accidental but never planned. The policy, as I was taught while training the elite security guards of Jerusalem is: Block, create distance, and shoot to kill. Anything other than this will put you and others in grave danger. No one in our current investigation questioned why did Michael not attempt a disarm. He moved away. As we always teach in our knife disarm lessons, seminars and DVD's– first choice is simply to get away. If someone is pointing a knife at you and you have time and ability to get away – do so! Do not be concerned with your " Street Creds ", Do not lunge in and try to grab the knife from the attacker. Do not attempt a disarm. As the headlines of our paper read – Why did he not shoot him? "Haim Ben Hor, manager of the dept of security and safety, reacted: 'The incident was supposed to end with the terrorist being fired upon. There was no problem with the security guards guns, no jamming or other technical problems occurred. The problem was a human error and this will be fully investigated and conclusions will be drawn." The guard should have noticed the suspicious behavior of a young Arab "hanging around' for too long. The guard should be aware t hat when asked to produce a document a potential attacker might just as easily pull out a knife or gun. He should have been aware and ready to respond. I discussed this case and the general idea of knife threats and knife attacks with a current instructor in the Israeli army and a combat commander from an elite unit. They both concurred completely with the sentiments expressed on this website. When I asked the commander, Roee, how he would deal with a knife attack , he answered, "I would hit him with my rifle, create some distance and shoot him between the eyes." His answer was immediate and did not require any thinking or contemplation. When I asked him about the possibility of disarming the attacker he looked confused and perplexed. He could not understand the logic behind trying to disarm a man with a knife. He asked me what kind of people think this is possible. 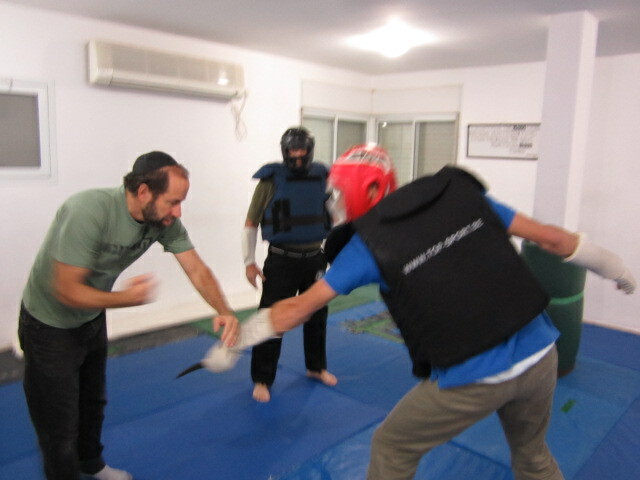 The instructor, Michal, expressed surprise that any one would attempt to take a knife away from an attacker. "not logical, too risky". 1. Evasive movements –The defender made a quick evasive movement and ran away. Either security personal neutralized the threat or the defender simply escaped. 2. Block and Run – In these cases the defender made a quick block and then escaped either unharmed or with a minor cut. 3. Struggle – In these cases the defender struggled with the attacker, managed to immobilize the knife hand, and eventually submitted or pulverized the attacker. In the one case I know where the defender attempted a disarm, it ended in his death. Conclusion: Do not attempt a disarm except under very unique situations, (to be discussed elsewhere). Hello Moshe! Great new blog. Some doubts came to my mind, now reading these 2 blogs: I know a case of a Mexican guy who had some training in Krav. He was attacked with a knife, he blocked the attack and then he tried to escape, but the attacker followed him and finally killed him. So, isn't it also too risky to leave a weapon in the hands of an attacker, even more, when this attacks happen in a very close range or in lonely areas? And, if you already submitted the attacker, is it valid to take the knife, throw it away and then run? As I wrote in the blog there are exceptional cases where a disarm is the only option, for example - if you are locked in a room with a man and there is no escape. Or if you are with your children etc, BUT I always stress this point - when you go for the disarm you are greatly increasing your risk. If you can run away - run away, don't take the risk. But if you cannot run away - then you must do the disarms that we teach, but always keep in mind that the disarms are risky and we only advocate a disarm when you have no other option. In most recorded cases, according to the police records, once a person blocks and runs way it is very rare that someone chases after him. It is very hard to attack a person who is running away, perhaps into a crowd, or maybe there is a bus or perhaps police are around. Learn Krav Maga, train for real life self defense. Join IKI (Israeli Krav International) on line and receive hundreds of Krav Maga training clips on line directly to your e mail. The latest from Israel, over an hour long, defense against knife threats from all angles, with grabs, standing, against a wall, on the ground etc. Immerse yourself in Krav Maga, for black belts and beginners, instructors and first time participants, we will guide you and help you realized your goals. Register now, for 10 days or longer.